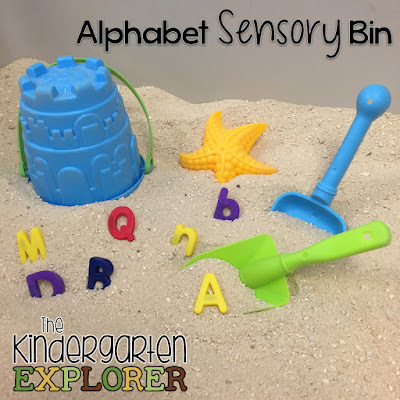 The Kindergarten Explorer: Alphabet Sensory Tub FREEBIE! So when I made the move to kindergarten, my teammate was getting rid of her sensory table and looking for something smaller. Since I had literally no furniture and was starting from scratch, I snagged it! 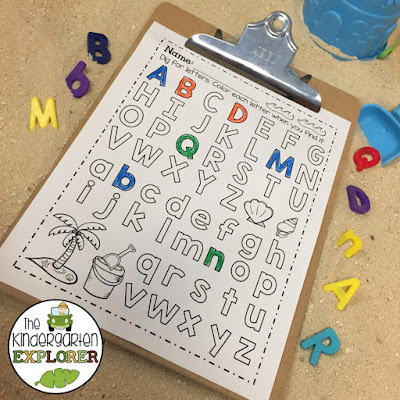 I immediately knew I wanted to fill it with sand for a letter activity. Ran to the local hardware store, snagged 3 bags of sand, and rushed back to school. Cue problem... the bags of sand I bought had been sitting outside, so the sand was wet. There was a little puddle in my car, but I didn't think much of it. Got to school, plopped them on a dolly, and started pushing them down to my room.... when I noticed the giant trail of sandy water following behind the dolly. Those dang bags were leaking EVERYWHERE!! I got them to the room, begged the custodian for forgiveness, and emptied the sand into the table, hoping that with a little ceiling fan action, the sand would dry out in a few days. Well, it didn't. A week went by and that sand was still soaked. I called Home Depot, asked if they had play sand, AND where it is stored. It was kept inside, so I knew it would work. I dragged the sensory table down the hallway, and pitched all the wet sand. Sand is really heavy. Especially when it's wet. This was quite an exhausting process. Once I put the new sand in, however... voila! I used magnetic letters from the Target Dollar Spot. One set of uppercase, and one set of lowercase letters. The shovels, buckets, and toys are from the local grocery store... snagged them at the end of the summer, so they were 50% off. 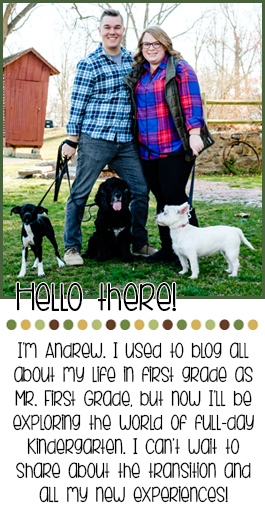 Whipped up a cute little recording sheet, which you can find on my FREEBIE TAB. Do you have a sensory table in your room? I'm thinking I'll leave this set up for a few more weeks, and I'm looking for some fun ideas for what to do next!